ï»¿	zodiac killer. Debra Perez, Baggett, zodiac letters, handwriting samples, the zodiac killer , letters bart baggett, americas most wanted. Bart Baggett - Founder of The School of Forensic Document Examination (Nation's only non-government 2-year career training in forgery detection & becoming an expert witness). If you want to be my personal apprentice, submit an application now for the next class of future document examiners. Class size is limited, but the scope of this career is not... so check it out today or call our admissions office today to discuss the program. Bart Baggett "forensic eye" points to different Zodiac Killer than the upcoming movie reveals. TV Show "America's Most Wanted" features Baggett's analysis of the killer's handwriting style and personality disorders. This 2008 newsletter allows you to view the samples and be the detective. Who do you think the Zodiac killer really is? Did the movie get it wrong? What do you think of the 2009 confession of Debra Perez ? Listen to voice message and newsletter Zodiac summary by pressing Play Below. You can stop, rewind, or fast forward at anytime. This opens in a NEW WINDOW, so you can click on images without restarting the audio message. Graphical images of scanned Zodiac letters published between 1967 - 1974. Some letters have high resolution versions, some are website viewable only. Click on the letter's image to seen the larger version, if available. Is there an injury anywhere on his body? 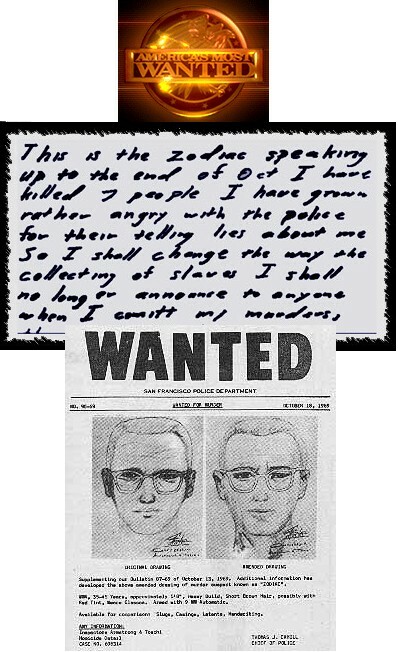 Stine Letter: The best "known" writing... most commonly believed to be authentically authored by the Zodiac Killer. 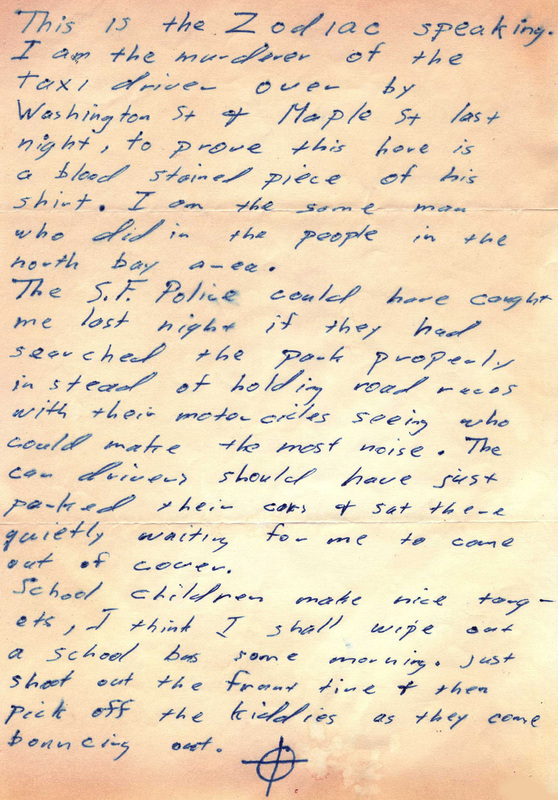 Mailed with a sample of murdered Taxi driver's torn shirt. 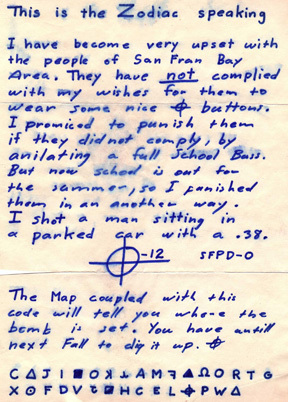 Examiner Letter: This letter was mailed to San Francisco Examiner and it is believed to be by the real Zodiac Killer. Beli Letter page one. Sent to attorney Melvin Beli. Notice first paragraphs have different handwriting style... but restrained style changes on page one... same author? Button letter. Mailed June 26, 1970. Sent to San Francisco Chronicle. Click for high resolution version. Riverside City College Desk Poem. Discovered December 1966. 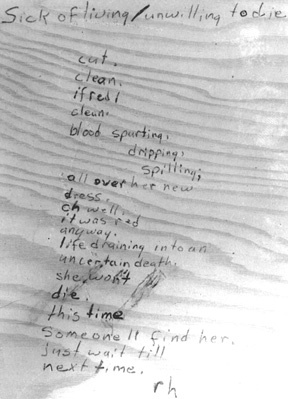 Written on the back of a wooden desk. Very controversial ties to the Zodiac killer. Zodiac Debut letter, received August 4th 1969. Sent to San Francisco Examiner. 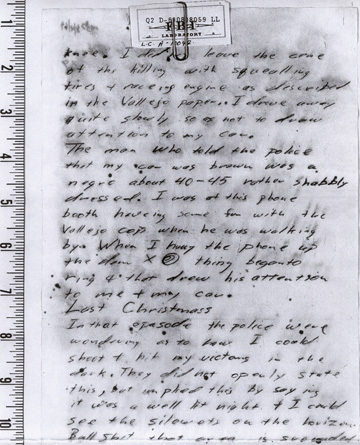 This letter is the first time the killer called himself the Zodiac. Note. These graphics were purchased from the most complete zodiac site available, and you can also purchase most of the high resolution graphics, and see other letters, not published here at the zodiackiller.com website. The person who runs this site, takes donations for the full graphics and has been very helpful during this investigation and TV show production. Read the Hines Report, which points circumstantial evidence at Lawrence Kane. So, who are the suspects? Rick Marshall, Arther Leigh Allen, Andy Walker, Lawrence Kane, Michael O'Hare, Bruce Davis, Ted Kaczynski, others? In my opinion, the zodiac writings don't match checks written by Arthur Leigh Allen , and the document examiner in the 70's agree. (see findings) Even his poorly written custody writing doesn't match. What about Laurence Kane's writing, from police files, under questioning... fake writing? See it here. The latest movie "Zodiac" (imdb link) stars Jake Gyllenhaal, Mark Ruffalo, and Anthony Edwards. 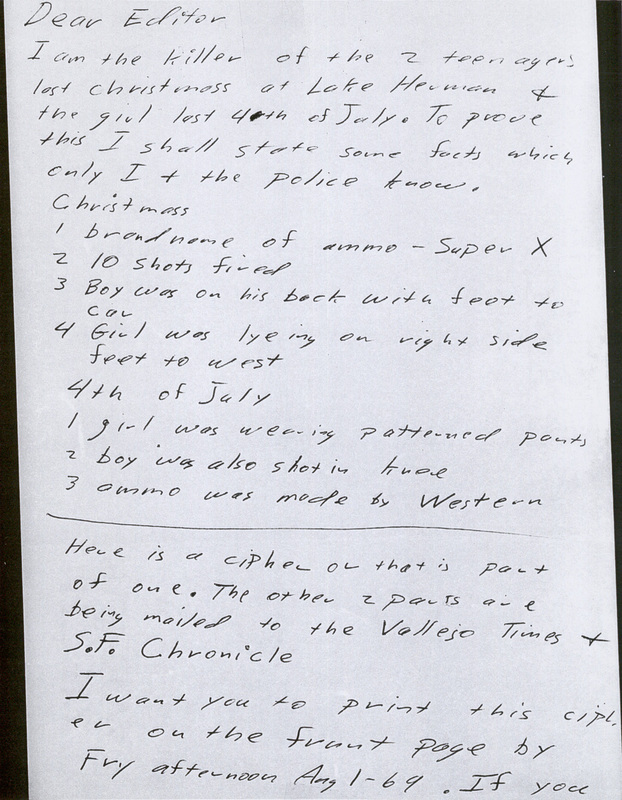 In the movie, the author suggest the killer is Arthur Allen, whose handwriting we do have a copy of on this site. However, Bart Baggett, contradicts this theory during the America's Most Wanted episode (air date Feb 24th) claiming the handwriting of the two suspects in the movie simply doesn't match. Leaving more questions as to who the real killer is. Watch the video of this appearance via the video podcast, subscribe here. Update, in 2009, Baggett still has not identified the Zodiac Killer's handwriting and found it to be "inconclusive with new suspect Guy Ward Hendrickson". The New York Times did not accurately quote Baggett's preliminary qualified findings regarding the handwriting of Debra Perez. 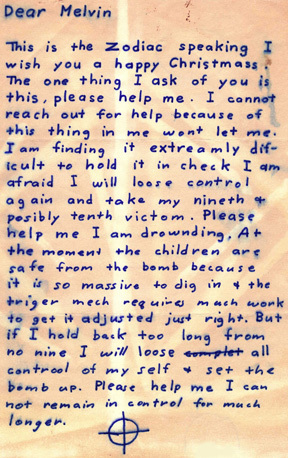 A Both psychological profiling and forensic document exam techniques were used to analyze the Zodiac Killer letters. You can learn one or both techniques through our home study course in graphology or our 2 year apprentice program in forensic document examination. Contact our office for details and pricing. 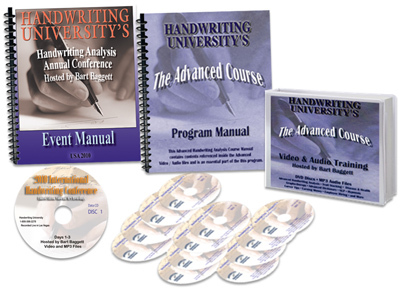 Level 1-4: Certification Level Home Study Course in handwriting analysis. Level 5: Advanced level home study course, includes health issues and career building.